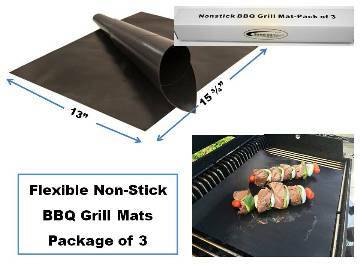 Navigate: StoreFront / EZ Juicers / Kitchen Gadgets / Miscellaneous / 3-Pack of Premium BBQ Grill Mats 15.75" x 13"
Size - 15.75" x 13"
BBQ grill mats are a handy way to enhance your grilling experience. Simply place the mat on your BBQ grill grate and place your food on the mat. The mat creates an even heat, provides a non-stick surface and prevents bits of food from falling through the grate. They are easy to clean and store and reusable many times. Perfect for grilling fish, vegetables, steak, chicken, shrimp, kabobs, and more. Works on all types of grills: gas, charcoal, infrared, and electric. These mats can also be used as an oven liner or baking mat.